Today is the first day of spring, and Mother Nature is starting the season with a mix of weather for Kiowa County. Temperatures continue a recovery from Friday's cold and snow, reaching into the low 50s Sunday before approaching 80 Monday and Tuesday. Near seasonal temperatures in the mid-50s return for highs Wednesday through Saturday, with overnight lows in the 20s most of the week. Friday will be slightly warmer in a high in the low 60s. Strong winds return Tuesday and Wednesday, with gusts of 30 to 40 miles per hour expected before moderating later in the week. 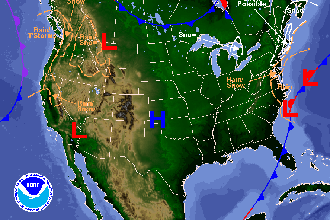 The best chance of precipitation is Wednesday as a low pressure system moves into the area. Scattered showers will likely remain north of Kiowa County, however rain becoming snow overnight is possible. There is some potential for precipitation over the Easter weekend, though it is too early to be certain. Check back for our weekend weather outlook for details.